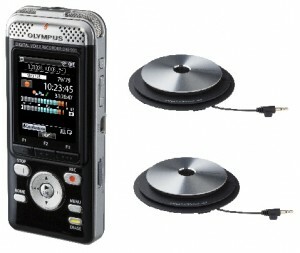 Recording meetings and focus groups has become even easier with Olympus’ new release DM-901 Linear PCM audio recorder. Two key features are standouts, and will be quickly embraced by busy professionals operating in fast-paced environments who demand flexibility and responsiveness from their devices. The DM901 is Wi-Fi enabled. Two Key Features are Standouts! The DM-901 is Wi-Fi enabled, meaning the device can be controlled remotely from an app on your smartphone or tablet, allowing recordings to be started and stopped from a distance. This app also enables Visual Index Function, which allows photos taken using the smartphone or tablet to be linked to the relevant section in the timeline of the audio file. This simple, effective, easy-to-use and interactive tool is an excellent example of how multimedia applications can greatly enhance the documentation process, providing thorough, accurate and comprehensive coverage of any recorded event. 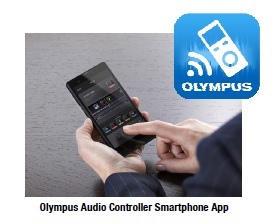 The Olympus Controller smartphone app is easy to use. files saved in either .mp3, .wma or Linear .pcm format. 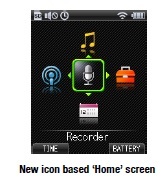 The DM901’s reconfigured home page screen features helpful icons. Recording Business Meetings and Interviews is Easy! The DM-901 is perfect for recording business meetings and interviews, and when paired with the ME33 boundary layer microphones, an excellent option for recording larger gatherings, including small conferences and focus groups. The DM-901 is now the new recorder of choice for researchers, business professionals, and anyone else wanting the best audio equipment which is easy to operate, has smartphone compatibility, and is available at a great price. Pair the DM901 with 2 x ME33 mics to record focus groups. Does the DM-901 Successfully Replace the DM-3? Replacing the dependable, hard wearing and quality-driven DM-3 was never going to be easy – how do you top exceptional audio quality? Olympus has managed to do just that. By observing, learning from and embracing our everyday use and application of multiple technologies, Olympus has created a responsive, high end audio device which is flexible and versatile enough to be used in conjunction with our existing communication devices, across a variety of professional settings and environments. 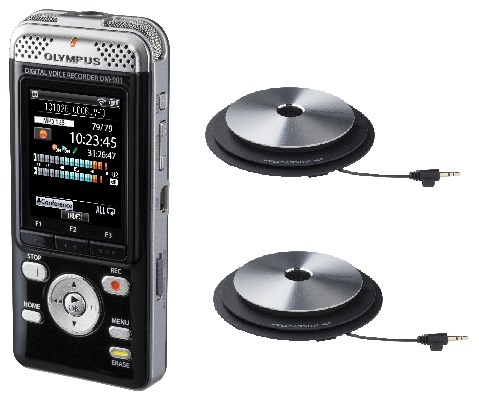 You can’t go wrong with the Olympus DM-901 voice recorder – a new breed of audio devices designed specifically for us to use every day. At Pacific Transcription we’re always happy to help with audio advice and support – contact us for further information, to discuss your specific recording needs or to let us know how you find the new DM-901. Where excellent audio quality really matters, the best advice is essential.